When the cabbie offers to take me to Sirkeci for 25 lira, I nearly bust a gut. I’m in the shadow of Hagia Sofia and could hit Kasap Osman with 2 good throws if you count the rolls. I’m not a taxi taker unless I’m thoroughly beat or seriously in my cups so I respectfully decline his offer [after briefly considering rolling him] to relieve me of my hard earned money through usury, and 5 minutes later I’m strolling past Sehzade Erzurum Cag Kebabi [ http://chowpapi.com/?p=151 ]. I muster up some serious inner reserves to resist stopping and wildly devouring a bowl of their crazy good red lentil soup [the best soup I’ve had in Istanbul] but manage to muscle past and am quickly seated on Kasap Osman’s patio. I’m afforded a view that quickly reminds me that I’m far from USA. To wit, a stream of men lined up at a fountain, carefully washing their feet before entering the nearby mosque. I’m reminded of a story a friend told me of her uncle, a devout Muslim from Izmir, who was relieved of his nice shoes he’d parked out front of a mosque while he worshipped. He had to walk home barefoot, and the family took great amusement at his plight. Kasap Osman is famous for Iskender kebab. I’ve had plenty of the fake stuff but this is supposed to be the real deal. The best in town, and outside a trip to Bursa, the most authentic to be had. I reckon it must be. Thin, wide slices of lamb doner are spit-roasted with charcoal, then seared and bathed in a tomato gravy. The lamb, tender and rich, is balanced with the acidic tomato. Served with yogurt, green chiles and quartered tomatoes, it’s an intense plate of food. For a starter I get the lentil soup and it’s fine but not in the same league as Erzurum. A well earned dessert comes after the long hike to Beyoglu, up-up-up the hill towards Taksim. I purposely walk as many miles as possible each day in Istanbul to keep my appetite raging. With thousands of restaurants and only 2 weeks of eating, you have to utilize as many tools as is possible. The narrow alleyway where Kasap Osman resides is a serious eaters dream. 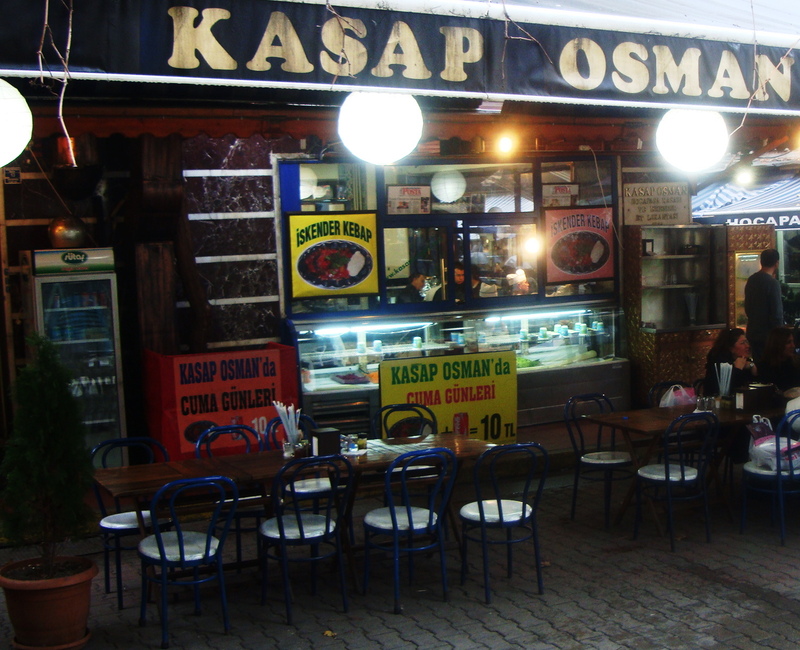 A brace of small restaurants dot the street, dealing all manners of Turkish deliciousness. Clearly, further investigation is warranted on my next visit to Istanbul. This entry was posted in Istanbul and tagged Iskender Kebab, Istanbul, Istanbul Restaurants Where The Turks Eat, kebab, lentil soup, Sirkeci, Turkiye. Bookmark the permalink.